How to Know When it is Time to Extend Waketime Length Between Naps. 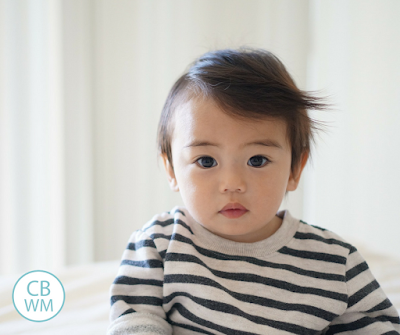 Follow these signs to change your Babywise baby’s schedule. Did you put baby down at the normal time? If not, try putting baby down at the same time as usual the next day and see if it continues. Is this a continuing trend? Sometimes baby will just stay up one day. If it is a few days, though, then baby likely needs a longer waketime. Is baby teething? Sick? Ear infection? Is baby over tired? This is a tricky part. If baby was up too long, then there will also likely be playing in the bed before naptime because a second wind will have entered. That is why I say if baby starts playing in crib despite a normal waketime length, consider extending waketime. Are conditions the same as usual? Same temperature, noise level, etc. Once you have considered those items, decide if you think it is time to extend waketime length. If so, your next decision is how much to extend it by. With Kaitlyn, I extend only 5 minutes and see how that goes. That is usually enough for her. With Brayden, we usually did about 15 minutes. As you get to know your baby, you will have a better idea of what to do, but I would recommend you err on the side of caution since too much waketime will result in poor sleep. If your baby is not to the point of waking up happy, he might cry instead of playing before a nap. But use caution with the younger babies because usually crying (that isn’t normal) means too much waketime. 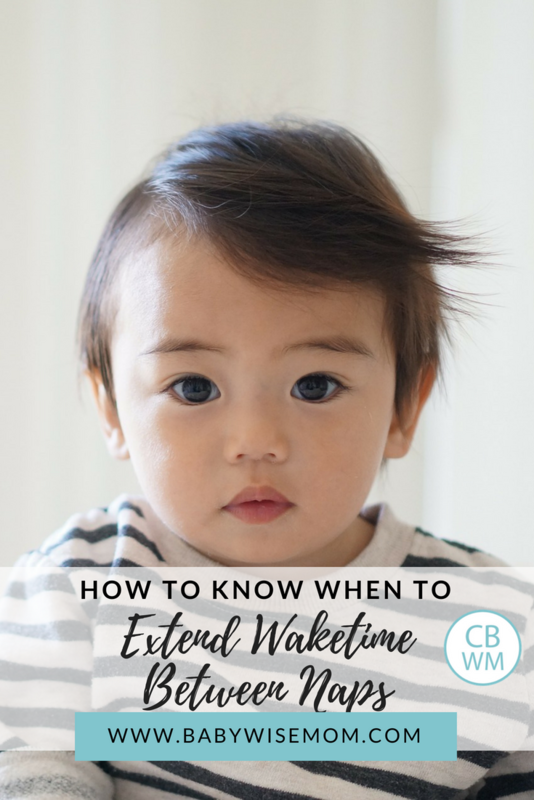 When you are extending waketime, I recommend that you do not force longer waketime. Follow the cues of your child. If you force a longer waketime before baby is ready, you are likely to have a shorter nap. My 8 month old stays awake 2 hours before her next nap. She still takes 3 naps a day. They are usually about 1.15 each. We haven’t gone to a strictly 4 hour schedule simply because her naps don’t stretch us to the 4 hour mark. We usually do 3 1/2 hours for feedings. I’m still giving her 5 feedings a day. Should I encourage stretching her to the 4 feedings a day, or are we okay to continue the five feedings? I just know that eventually her solids should line up with our meals. When should that come? What about 22 month olds? He used to nap from 1-4, but lately it’s been a battle to get him to go to sleep. He’ll yawn at 11 am, but by the time we eat lunch at noon, he seems to get another wind and often is awake in his crib until after 2:00 – sometimes 3:00! What do you think? Move the nap up to 12:30? 12:45 or move it later to 2:00 or something like that? Heather, I would continue with the five feedings; there is nothing wrong with it, and if you are breastfeeding, BW says some moms need a 5th feeding to maintain supply. So there is not problem there. Always do what your child needs.I have found mealtime starts to become more like the family’s around 9 months, but isn’t really there until closer to a year, give or take a month or two. For us, breakfast and lunch were easy to line up. First was lunch; I would nurse her then feed her her solids, then she ate finger food while we ate. Breakfast came when she was weaned at 1 year. She got up and drank her milk while we ate breakfast, then she ate her breakfast. Dinner came and went while dropping that 3rd nap. She was fully dropped at about 11 months. She would then always eat dinner with us, but I also fed her baby food. Between 12-13 months, we went to her just eating dinner with us and not feeding her additional food. Stephanie,Has he been waking up earlier or going to bed later? I know that since June has the longest days of the year, that can often lead to shorter nights for kids. Either way, if he is tired earlier, I would try putting him down earlier. I think I would try 15 minute increments and see how it goes. He really shouldn’t be needing less sleep at that age yet. Good luck! Megan, Thanks! Well, at 7 months my daughter was just starting to be a little longer than 1 hour, so 1.5 hours sounds so long to me. BUT my son could do 2 hours. I would wait until she shows cues that she is ready to extend that waketime. I think she sounds like she is doing just fine. It is likely to come relatively soon (my guess would be in the next couple of months), so watch for it, but don’t push it. Thanks so much. That makes me feel much better! It’s always so great just to have an “example” to follow. I appreciate your input so much. Valerie,I was wondering about Gabby’s meals lining up with our meals. Right now she eats breakfast at 7am, lunch at 11am and dinner at 3pm. Breakfast and lunch I don’t see as a problem. I was wondering how to move her dinner closer to our dinner time. She will be 12 months July 2nd. Would I just give her a snack when she wakes up at 3pm and give her dinner when we eat dinner? What are your thoughts? Yes, that sounds perfect. I will give Kaitlyn her milk when she gets up (she gets up about 4/4:30). We usually eat dinner about 5/5:30, so milk is enough to hold her over. But if you have a logner wait period, then I would do milk plus a small snack (and something light like fruit), then dinner with you. So for the last week or two, my now 6-week-old has started “playing” in his crib at many of his naps. He just lies there happily, making cute little baby noises here and there, but not fussing. Sometimes he will do this for up to an hour. Crying almost always follows though. Sometimes he will cry and fall asleep within 15 mins (I always wait 15 mins of crying then go in and rub his head and assure him everything’s ok), sometimes I have to go in there to comfort him then he cries a little longer and goes to sleep. I’m concerned because when he has the longer “play times” in his crib, by the time he gets to sleep he is only sleeping 45-60 The confusing part is I put him down right when I first see him yawn, so I don’t think he needs longer waketimes. Sometimes he does yawn when I’m feeding him or changing him, but I have to do those things and obviously can’t put him to sleep at that time. Maybe he is over tired as you said in the post, but I don’t know how to get around that because as it is, he is only awake long enough to eat and get changed basically. Please help! khadija, I apologize, I just now saw your question. Please let me know if you still have troubles. jencwu, how long is he awake? I would mess around with the waketimes, and if he is only awake long enough to get changed and feed, I would try adding about 5 minutes of play at a time and see how that goes for him. The time he usually does this is his first nap of the day. I usually wake him up at 7, feed him, burp him, then change him and get him dressed. This takes about an hour or maybe an hour and 5 mins or so. This is usually his longest waketime of the day because I change his clothes, except for the nights when he has a bath. The other waketimes during the day average about 50 mins. Feeding always takes about 30 mins but sometimes it takes longer to burp him or change his diaper. A lot of times he is falling asleep while I’m changing him even, except for that first one of the day. Unless he’s so tired he’s falling asleep while being changed, I usually hold him after changing him and talk or sing to him until he looks tired (which is typically only a few mins). I’d say that first nap is usually the toughest one–he does not sleep much if at all for that nap. My 4 month old currently has 1.5 hours of wake time and is on a 3 hour schedule. So his naps are 1.5 hours as well. I usually have to wake him and I was thinking of attempting a 4 hour schedule but is it realistic to think that he will sleep 2.5 hours? I don’t think he’d sleep that long and am thinking I have to wait until he can stay awake for 2 hours to move him to a 4 hours schedule. What do you think? Is 2.5 hours typically too long of a nap? I know that you said to read the blogs before emailing you….I have…and have printed many of them out and have a binder going and making a small book of them! I’m in quite a bind though. We got back from a vacation, and upon returning, our “good baby” turned EVIL! He was horribly fussy, waking up 5-6 times a night…we had him checked at the Dr. TWICE only to have her say he is fine and a healthy 5 month old…We finally got him back on schedule, and things seem to be doing a lot better. I was hoping that once we started him back on the “baby wise” routine, he might start to nap better with the “re-boot” to his system. Still…he NEVER sleeps longer than 45 min for naps…never has. He wakes up pleasant though. Should I be worried. Baby wise and others say he should be sleeping 1.5-2 hrs at this point…I tried letting him CIO for 3 days for his naps…he cried the whole 2 hours…Should I just be content with the 45 min naps (I know you said Brayden did this for a while, but got over it…how long did it take? )Or should I insist on sleep training him in the day to get him to try to take longer naps? Please help! jencwu, since he usually only does this for his one nap where he gets a longer waketime, I would say that tells you that waketime length is not good for him. I would try to rearrange things so that waketime can be 50 minutes like the others. Keep in mind that the first waketime at that age is often the shortest. LEM, you could do a 3.5 hour schedule or a combo 3/3.5 hour schedule. 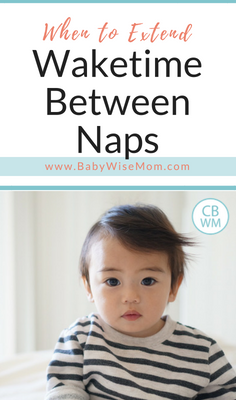 A 2.5 nap is possible, but it is really going to depend on your child. I don’t think most will take that long of a nap. My daughter did, but my son never did. I have a question. My little scoots (4months) seems to go to sleep within 10mins of putting him down-no tears.Its at his 45 min sleep cycle that he will wake up. But still no tears-he just plays with his toes in bed. This is a new thing-but he will do it for the rest of nap time. Then when I go to get him to eat-he gets cranky too soon before his next nap time.He also started doing this at night. Last night he woke up at 9pm and started playing and talking in bed. He did this until 10pm.Then he woke up at 2:30am 4am and 5am. Again, no tears or crying, just talking and playing in bed.Today I tried to see if he would stay up a little longer-5mins just like Kaitlyn-but he got really cranky and then he cried before going to bed. Everything out there is for if your baby wakes up crying-but no one says what to do if your baby wakes up several times in the night just to play. He doesn’t have days and nights mixed up because he doesn’t sleep all day either, abt 4 hours total in nap time. Any ideas? Brayden was 6 months old before his naps got longer. I would continue to troubleshoot, but I wouldn’t try to not worry about it. You can only do what you can. I have a friend who went through 45 minute naps for her daughter’s first 13 months. She has actually written an article for me I will be publishing this Tuesday, so be on the look for that. Val, congrats on the pregnancy. I hope that all goes well. I love your blog. You are a godsend to us Babywisers. My son Grayson’s teachers at daycare are thinking it might be time to extend his waketime. He is 4mo. old. Here is where I am at, give me your thoughts. We are currently on a 3 hour schedule with cluster feeds in the evening (1-2 hours). He has been doing well with 60-70 mins of waketime and then he takes a 1.5-2 hour nap, he generally goes right to sleep when they lay him down. He usually sleeps somewhere between 7-9 hours every night. He usually wakes up between 2 and 4am and takes a full feeding (I have tried just doing one side, no luck, he wants a full feeding). And then his first morning feeding is at 7a (which he is not really excited about). The only feeding they don’t have to wake him up for is his 10am feeding. I am sure that is due to his disinterest in his 7am feed. We are currently doing 7 feedings. I stopped doing the dreamfeed at 2.5 months and he was doing 9-10 hours for a couple of weeks. Then he started waking up again. I am considering extending his schedule to a 3-3.5 combo (this would drop us to 5-6 feedings) with 80-90 mins of waketime and 1.5-2 hours of naptime. Also, I keep thinking I need to add the dreamfeed back in. Unfortunately with the daycare I need to make a new schedule for them to follow. they will stick to the schedule I give them which is good, but it will be an all at once transition. I know he needs the 1.5-2 hour nap regardless of his waketime, so that means extending his schedule I guess. Please give me your thoughts. I need another BW mom to bounce this off of. Thanks for your time. Im sorry, I didnt even leave her age! Shes 16 weeks…turns 4 months next Thurs. Shes not in a growth spurt either…she ate a lot yesterday but refused to eat much at all on her second feeding today. If she was on one, I dont think she is anymore! Jenny, have you seen the post "Nap Disruptions: rolling, standing, crawling, etc."? That would tell you my tips on what to do about the standing. Once he gets over that, he should go back to sleeping. But I also get a high volume of questions about 10 month olds and sleep problems, so it might be an age thing. Callie, you could try moving it up 5 minutes at a time (so 55 min. then 60 min if that didn't work) to see if that helps.But it might not be a waketime length issue, so be sure to look at all of the possible reasons for early waking before you tweak too much. Keep a waketime length log so you can be sure you are seeing the full picture. Val, I've kept a log for quite a while now. I know that the 45 min waking is a transition problem and I'm just riding that out. I was more wondering whether or not I can extend waketimes like normal because of the fact that my DS wakes midnap every nap and takes a little while to fall back asleep, so he's not getting continuous sleep…so will his waketimes always have to be shorter until he develops out of the 45 min transition problem? I wouldn't extend waketime until he is sleeping for full naps consistently–but that is assuming waketime length is perfect right now. Since he wakes early, and if it isn't a growth spurt reason, then I would guess waketime is not exactly right, in which case he might need it longer right now. Good luck! Waketime can be tricky to figure out.